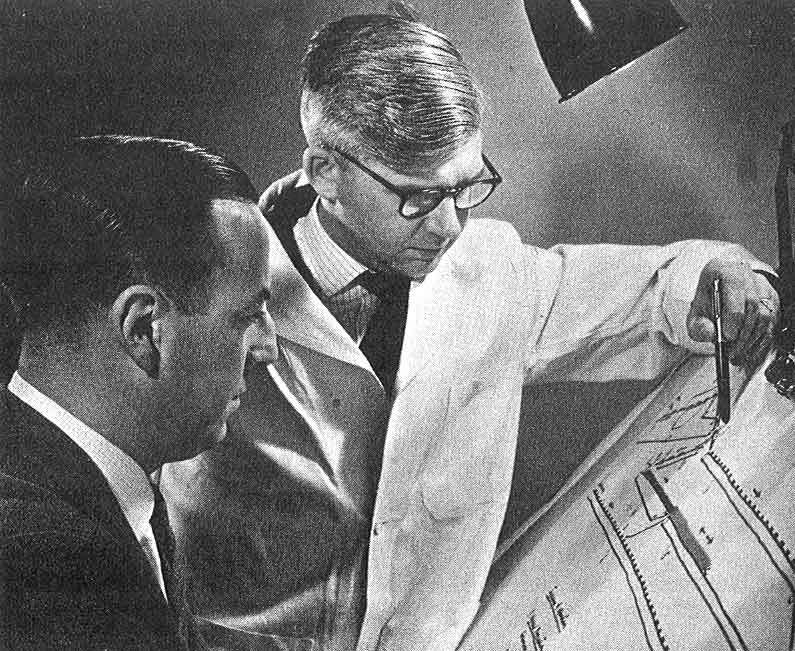 In the late fifties, when the group was entering its major phase of growth by acquisition (see also History of Baker Perkins Ltd), Barton Baker had the idea of setting a new design and development centre that would be free from the day-to-day pressures to which the existing design office and experimental department were subject. An investigation to find a small company that would fill the bill soon threw up the idea that it might be better to look for the right kind of person rather than a company. 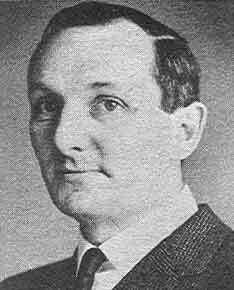 Percy Packman, an inventive person operating with only a small staff in Twyford, Near Henley-on-Thames, turned out to be that man. Packman Machinery Ltd. was in business at Twyford in Berkshire as a design and development company. It had begun life in 1941 as Modern Designs Ltd of Hurst Grange, Berkshire, producing potato planting and harvesting equipment, moving to Twyford just after the war and continuing to develop potato machinery for the next nine years. In 1955 the company began to spread its activities as outside contracts were accepted. Early successes included a machine to manufacture tin boxes and floodlighting towers for Wembley Stadium and nearly all of the first division football grounds. Acquired by Baker Perkins in October 1958, the company had been associated with Baker Perkins Ltd and The Forgrove Machinery Co. Ltd. in the development of specialised equipment for some time prior to acquisition. In particular, it had carried out projects on biscuit handling for a large manufacturer and was thus seen as having a future as a research centre for the whole organisation. The members of the team at Twyford, working under the chairmanship of H.D. 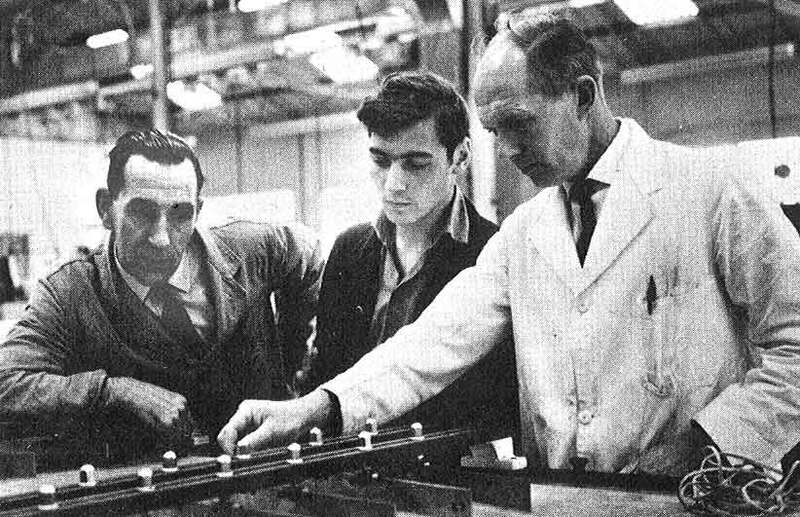 (Bill) Byles, a director of Baker Perkins Ltd., were essentially 'back-room boys' – design engineers able to "work in quiet rural surroundings away from the stresses of a large production factory". David Morton headed a team of 14 designers and draughtsmen working on biscuit handling problems and the development of some of the vital automatic handling links between machinery made by other members of the Group. Foreman of the machine shop was Mr. "Pete" Simmons who had a staff of 26. 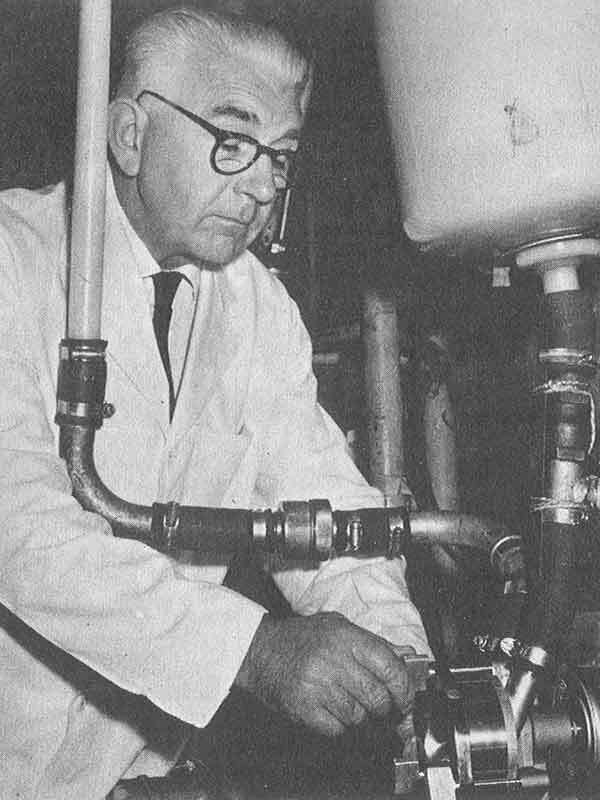 "Most of the ideas originated from David Morton, with help from the small but very talented group, consisting mainly of Percy Morrison and his son Bob.The company was unique in that the group of engineers sold their solution to each customer's problem, and proceeded to design it, build it and install and commission it to the satisfaction of the customer. 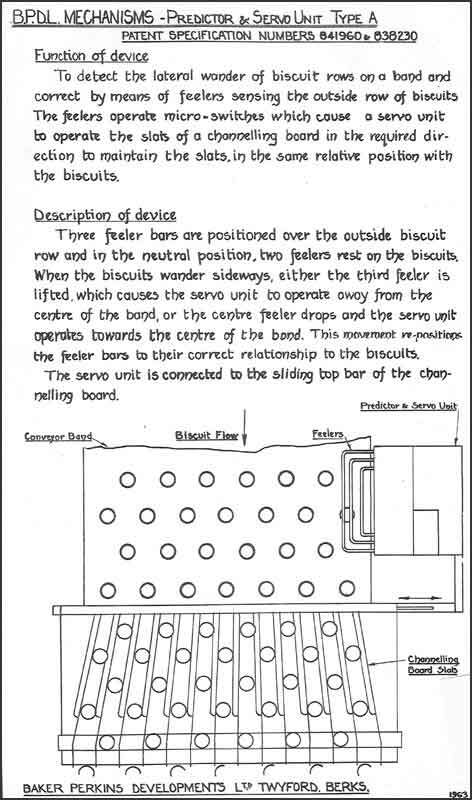 This method resulted in fast turnaround, and, usually, successful installations The reason for their existence was to help Baker Perkins Ltd, sell more biscuit machines and ovens, by linking the various pieces of equipment and feeding the resulting biscuits to Forgrove wrappers. Our chief and worthy competitor was SIG. I had the pleasure of working there while Bill Byles was managing director. In all it was a wonderful experience, being in the country, away from corporate office, and with little or no impediment to getting things done in a hurry, as we had our own small machine shop. We were assisted by the fact that we did not have to show a large profit,but had to be sure we broke even, covering our costs". Not all of the equipment produced at Twyford was directly associated with the markets served by Baker Perkins. Over the years the machines turned out by Twyford varied from an artificial snow dispensing machine – widely used for television and film work – to the collapsible "Packflat" barrows used to carry tins of biscuits. Planting machines were made for the Forestry Commission and floodlighting towers for an oil company in the Middle East. 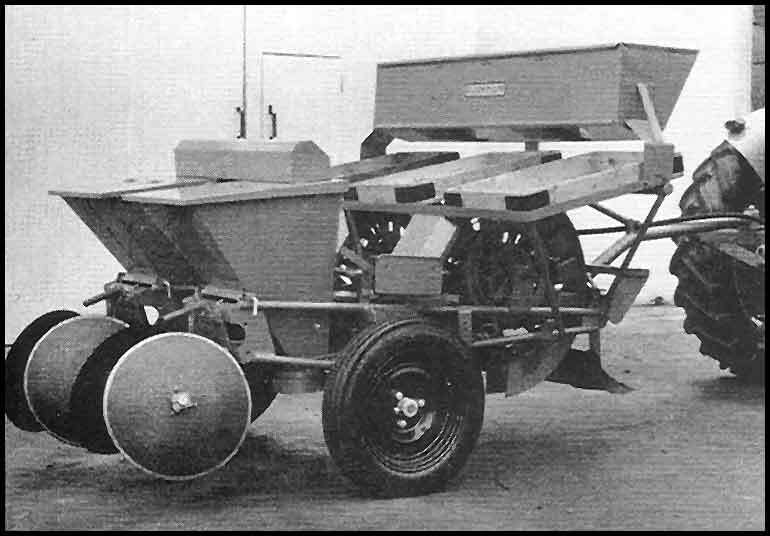 The company's first successful trailed potato planter was designed by Mr Percival Morrison who was involved in many of the company's developments since 1945 and did some of the original work on the automatic handling of biscuits. A potato harvester was somewhat less successful. The machine included an ingenious method of separating the potatoes from similarly sized stones. This consisted of a vibrating conveyor embodying little rubber ’prongs’ into which the heavier stones became sufficiently embedded to be carried out of the way while the lighter potatoes bounced on into the collecting bin. Sadly, the harvester did not have as wide an application as was once hoped and the limited trials foretold. This was because some of the heavier soils clung too closely to the potatoes – and the stones. The inventors at Twyford were encouraged to follow a project from the earliest stage of rigs and models right through to the installation of the finished plant in a customer's factory. Perhaps the greatest contribution made to the Group by Baker Perkins Developments was in the specialised automatic handling of biscuits, confectionery and cartons to provide efficient feeding of high-speed wrapping machines. 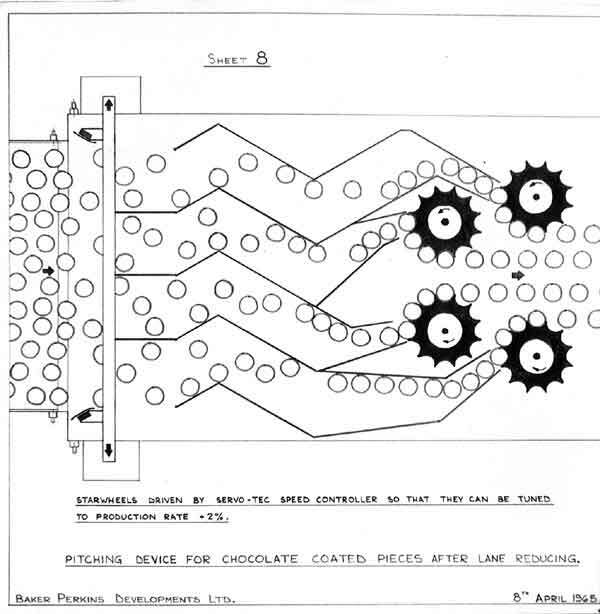 Over time, the early designs of relatively simple biscuit handling units were replaced by impressive installations capable of measuring the number of biscuits required for each package – controlling the 'overweight' which had previously been given away to keep within consumer protection laws. One of the group companies that approached Percy with a problem was Baker Perkins Jaxons. An unpleasant and labour intensive job in laundries was feeding damp sheets into a multi-roll ironer. The sheets arrived at the ironer in a pile and had to be laid out flat before feeding them between the heated rolls that did the ironing. The Jacks brothers hoped that Percy would be able to mechanise the work and briefed him accordingly. Percy came up with an ingenious solution whereby clips would be fastened on to the two leading corners of a sheet. These clips would be attached to chains that moved apart to straighten the leading edge of the sheet so that it could be fed into the ironer. It was then a much lighter job to see that the remainder of the sheet was sufficiently unfurled to be pulled flat into the machine. Percy’s idea was to have the clips to be moving slowly enough for them to be fasted to the sheets by hand and then for them to speed up to the input speed of the ironer. 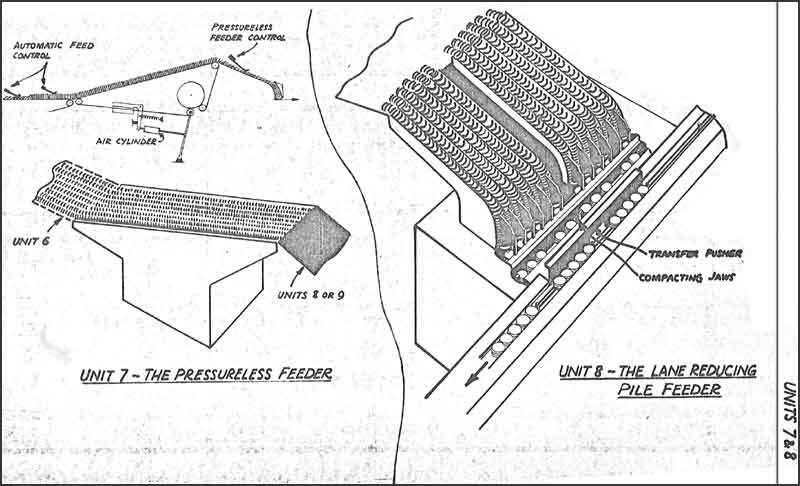 He achieved this by attaching each clip to a chain whose links were ‘zigzagged’ together so that it would move slowly at the clipping stage and then, as the chain links opened out longitudinally, their speed would increase to that required by the ironer. Percy successfully demonstrated his idea to the Jacks who then said "fine, but are you sure that it will work on damp sheets?" Percy hadn’t realised how severe this requirement was and the Jacks hadn’t told him …….. End of project. Another challenge was set by the Bakery Division – how to mechanise the process of rolling up Swiss rolls – at the time a very labour intensive and fiddly job, done by operatives sitting beside the "carpet" of sponge as it emerged on the conveyor fed from a long continuous oven. Cuts were made transversely in the carpet at Swiss roll width intervals and the operatives laboriously up each one, pushing it across the conveyor. Percy devised a method of rolling the carpet of sponge continuously by gradual rotation so that it became an endless roll as it progressed. All that was then needed was a guillotine to cut off the required length to make the finished Swiss roll. The demonstration led to the question – " Fine, but don’t you think that it will become gummed up when the sponge has a layer of jam applied before the rolling?" This problem was not surmounted either. 1962 saw Baker Perkins Granbull, a manufacturer of equipment for the plastics industry that had been acquired by the Group in 1960, moving from Kingston-upon-Thames to the Baker Perkins Developments' factory in Twyford - although being designated a subsidiary of Baker Perkins Chemical Machinery Ltd, Stoke. 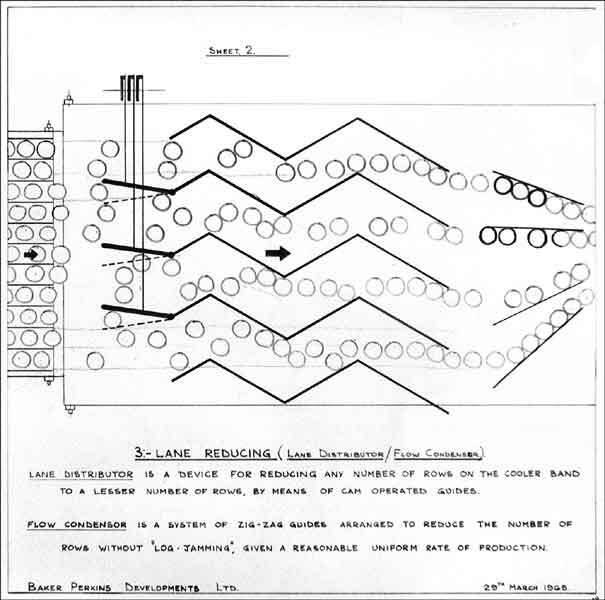 Its stay at Twyford was short-lived as despite the business's innovative approach to product development, this venture into plastic bottle blowing and filling equipment had involved the Group in sizeable losses and the affairs of the Granbull division were wound up in 1967. (See History of Baker Perkins Granbull). 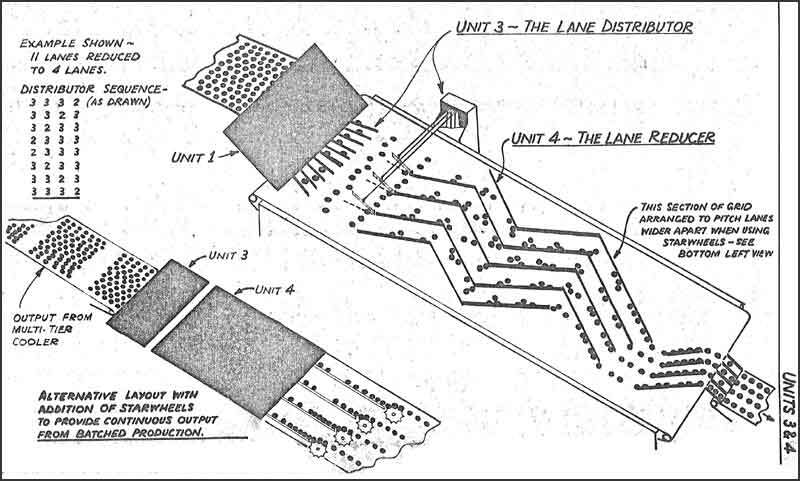 By 1968, Baker Perkins Developments was actively exploring other possibilities of offering its accumulated knowledge of high-speed mechanical handling more directly to customers of group companies. The best year in its history came in 1969 with repeat orders for standard biscuit handling equipment, resulting from increasingly close working with Rose Forgrove with David Morton acting as the link man". In 1971, at the same time as the move to give manufacturing companies more direct access to, and control over, their markets and sales outlets, and recognising the increased concentration at Twyford on the high speed automation of feeding packaging machines, Baker Perkins Developments was absorbed into Rose Forgrove, Leeds. With the transfer of its product lines to Rose Forgrove and Confectionery Developments Ltd, Hemel Hempstead, the business closed in 1976 and the premises at Twyford were sold. The company had been trading profitably, but on a small scale, and it was considered that the move would result in a better deployment of group resources. 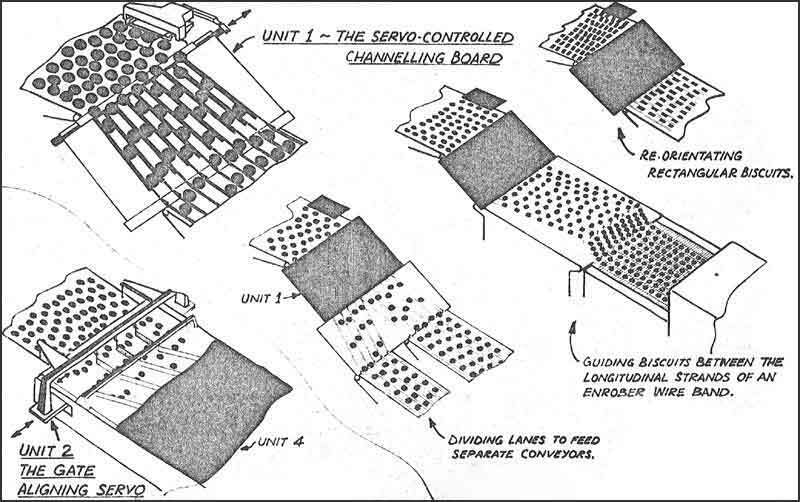 The Twyford biscuit handling techniques were further developed , and became part of the product line, at Rose Forgrove. (See also History of Baker Perkins in the Packaging Business). Later, the Special Projects Division of Baker Perkins Ltd's Biscuit Division incorporated many of the techniques in their 'Packing Hall' concept, see History of Baker Perkins in the Packaging Business - Special Projects and the Senator and History of Baker Perkins in the Biscuit Business - 1976 to Paston. A discussion with a customer would lead to ideas and concepts being sketched out on the drawing board with, on occasion, simple rigs being produced to test theories. 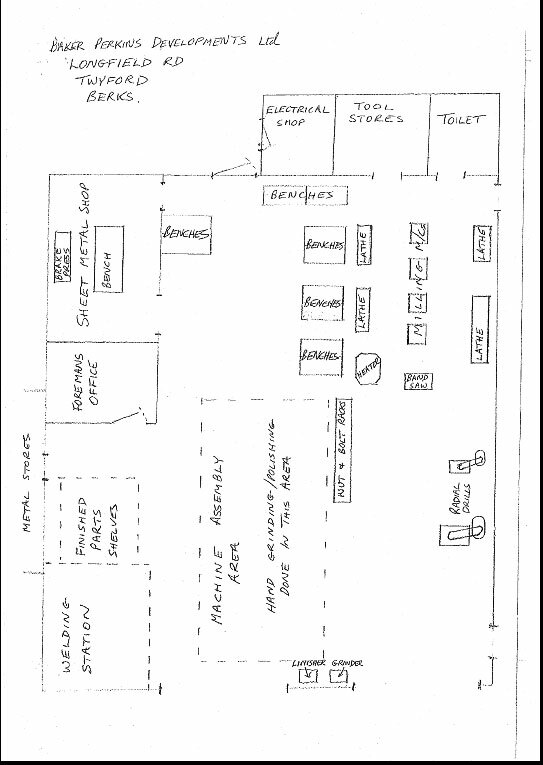 A working layout would follow, then production drawings. Being a small, self-contained unit, able to work without the need for the complex systems and procedures necessary at Westwood Works, Twyford was able to convert ideas from concept to commissioned production machines in relatively short time-cycles. Biscuits are, first and foremost, a foodstuff, so careful and hygienic handling at all stages of production is essential. Biscuits are also extremely fragile and because of this, until well into the middle of the last century, the majority of the labour employed in a biscuit factory worked in the packaging area. Controlling 2 tons per hour of individual biscuits, being delivered to the wrapping machine in as few as four rows, calls for some ingenious mechanisms. These must work faultlessly hour after hour. 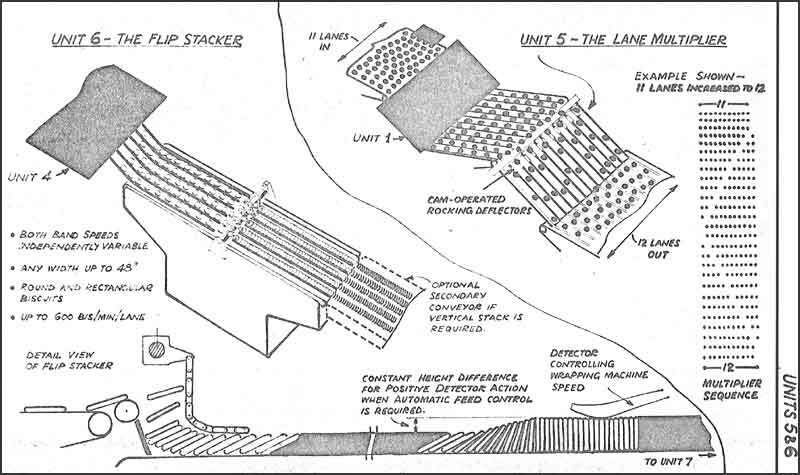 A biscuit plant cannot be stopped instantaneously - the biscuits remaining in a stationary oven would soon catch fire - and the speed at which a pile of biscuits is created on the floor, after even a short hold-up at an output of 2 tons per hour, has to be seen to be believed! When the biscuits are coated in chocolate, the problems only increase. 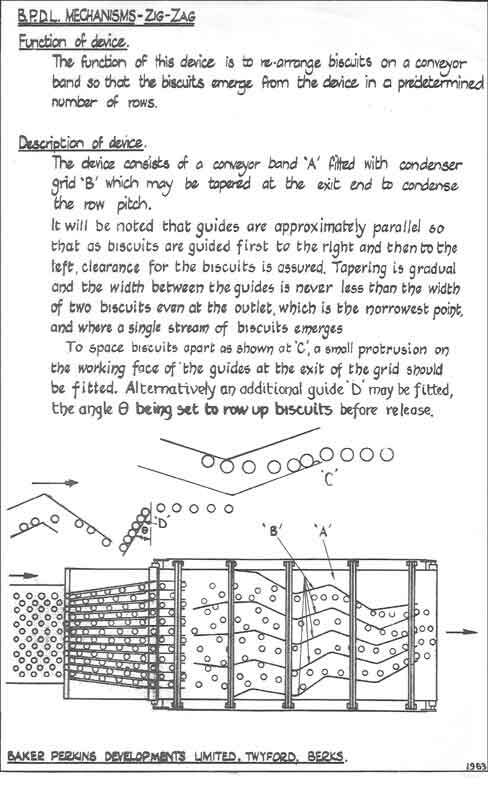 The task appears simple - take the rows of biscuits spread across a, typically, metre-wide cooling band, and marshall them into columns or piles prior to wrapping. The number of biscuits in each packet is important, there are legal restraints on the weight of a packet of biscuits - one biscuit too few and a fine is a possibility, one biscuit too many and profitability is compromised. It is known that, even in the best maintained biscuit plant, the weight (and perhaps thickness) of a biscuit will vary slightly depending on where across the band it is baked. Ideally, each 'slug' of biscuits fed to the wrapping machine should be taken from across the band to even up any weight and/or thickness variations. A further complication comes with the desired package style - biscuits are typically packaged in 'rolls' or 'piles'. That is the problem - some of the solutions devised by Baker Perkins Developments are shown below. The development sketches are self-explanatory. More photographs of finished machinery will follow.